The aim of the Cawood projects was to involve the whole village community in the better understanding of the history of the village. The Cawood Castle Garth Group was formed in 2003 and has undertaken a wide range of heritage initiatives over the period from 2003 to the present, culminating in 2015 with the archaeological evaluation of the Keesbury Moated Site, a scheduled ancient monument. The active members of the Group includes a large proportion of the village and includes all ages and abilities. 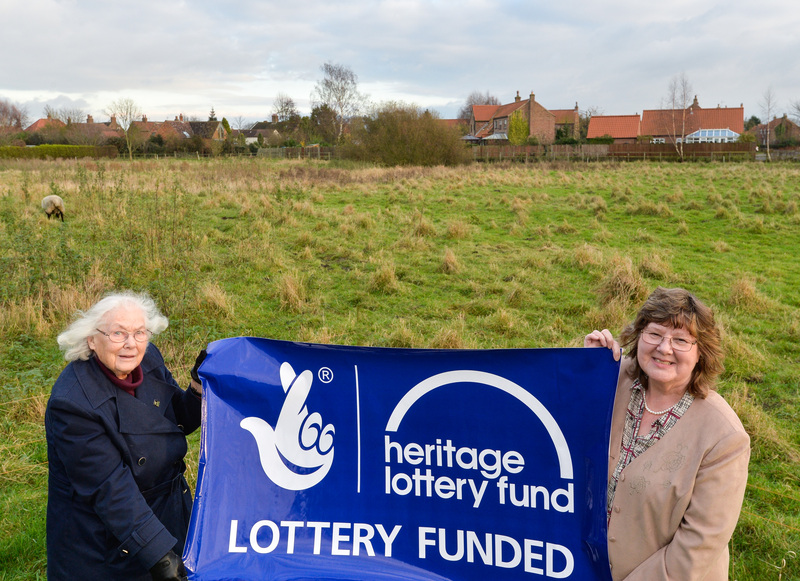 The Group has gradually assembled a history of the village, revealing a wealth of little known detail and connections that have been amassed into a Conservation Plan . The evaluation excavations began on the Garth in 2008 and again 2009, sampling areas to identify where intact archaeology existed and at what depth. This then led to choices about how Group managed and used the Garth. In 2015, a new project on the de Cawood family site, Keesbury Manor, involved trenches being dug and the community discovering earlier layers of history back to Anglo/Scandinavian times, including possible jet-working, a wholly unknown aspect of the history of the village. Keesbury Manor, formerly known as ‘The Gooseberries’, was an HLF funded project , which researched the school records , newspapers and also included the recording of oral history, identified that the site was one of the most important sites for gooseberry production in the village. Booklets have been produced on the history of the Castle Garth , a walk around the village , Gooseberries in Cawood and the results of the Keesbury Manor project. The Cawood Castle Garth Group has been so successful that the HLF use the group as an exemplar of a community heritage group. 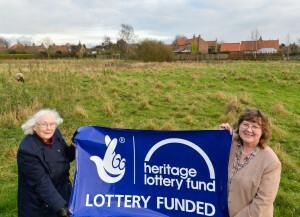 Their Chair, Margaret Brearley is also employed by the HLF as an advisor. 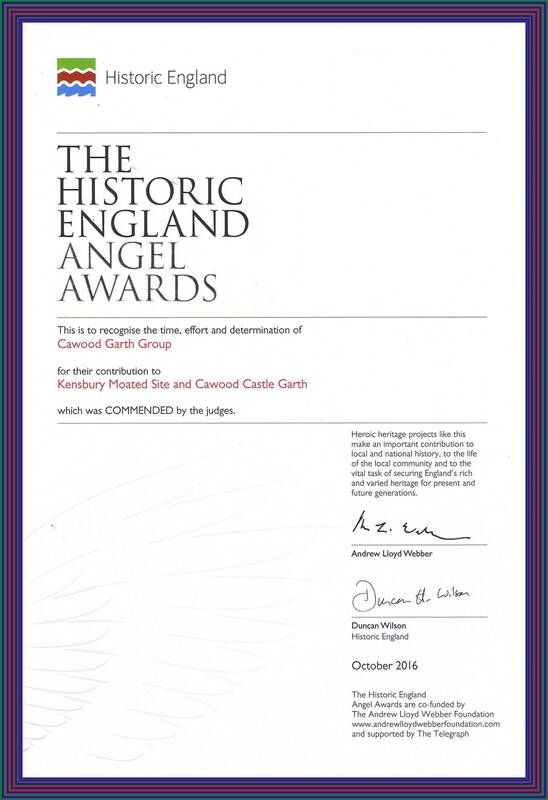 The group were successful in being awarded a Commendation from the Historic England Angel Awards 2016 for their work on both the Castle Garth and Keesbury Manor. 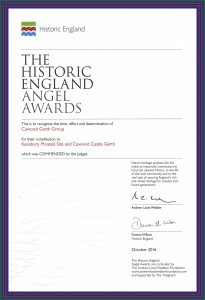 The Awards team very much valued the work we are doing to protect Cawood’s Heritage for future generations. Cawood Castle Garth Group are currently a group of 10 residents of Cawood who research the history and ecology of the village and district. 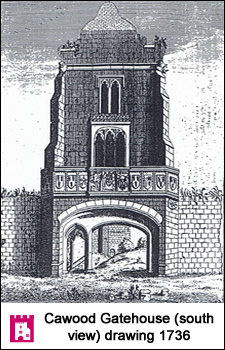 At the meeting, English Heritage encouraged the village to manage the Scheduled Ancient Monument known as the Castle Garth. To do this we could apply for funding from the Lottery. We were lucky to be awarded £28,300 for specific tasks and equipment to research the Garth. One task was to build a bridge across the inner moat. 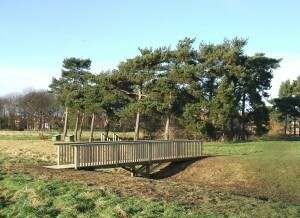 The grant paid for disabled access across the site with a moat bridge and footpaths. It also included surveys and training for volunteers in Archeaology, Ecology and in many aspects of research. We wrote leaflets, guides to the site and the village and designed Interpretation boards which showed the results of our research. We now manage the site on behalf of the Cawood Parish Council..